Many healthcare providers test every pregnant woman for diabetes, usually around the end of the second trimester. Testing is important if you have a family history of diabetes. Blood tests used to diagnose diabetes are a fasting blood-sugar test and a glucose-tolerance test (GTT). For a fasting blood-sugar test, you eat a normal meal the evening before the test. In the morning, before eating anything, you go to the lab and have a blood test done. A normal result indicates diabetes is unlikely. An abnormal result (a high level of sugar in the blood) needs further study. Further study involves the glucose-tolerance test (GTT). Again you must fast after dinner the night before this test. In the morning at the lab, you are given a solution to drink that has a measured amount of sugar in it. It is similar to a bottle of soda pop but doesn’t taste as good. After you drink the solution, blood is drawn at certain intervals, usually 30 minutes, 1 hour and 2 hours, and sometimes even 3 hours. Drawing blood at intervals reveals how your body handles sugar. If you need treatment, your healthcare provider can devise a plan for you. Teen pregnancy impacts our society in many ways and costs the United States about $7 billion each year. Teen pregnancy is defined as pregnancy in young women between the ages of 13 and 19 years of age. Young women in the 18- to 19-year-old range have the highest pregnancy rate among teens. The United States continues to have the highest rates of teenage pregnancy/births in the western world. Some ethnic groups in our country are at higher risk. Teenage births have dropped by nearly a third since the early 1990s. Some experts believe this drop in number has occurred because the overall birth rate in the United States has fallen. Thirteen percent of all U.S. births are to teens; 24% of births to unmarried women are to teenage moms. About 65% of all teen pregnancies are unplanned. An unplanned pregnancy is defined as a pregnancy that was mistimed or unwanted at the time of conception. Pregnancy in a teenager can be difficult for the mother-to-be for many reasons. Many teens do not seek prenatal care until the second trimester. Many teenage mothers-to-be have poor eating habits, and often they don’t take their prenatal vitamins. A large number of teens continue to drink alcohol, use drugs and/or smoke during pregnancy. In fact, teens have the highest smoking rate of all pregnant women. Studies show pregnant teens are often underweight when they enter pregnancy and often do not gain enough weight during pregnancy. This can lead to low-birthweight babies. Teen mothers are also more likely to give birth to premature babies. Other problems include anemia and high blood pressure. Depression during pregnancy has also been reported to be higher in teens. Babies born to teen moms may also have more birth defects. Sexually transmitted diseases may be a problem for pregnant adolescents. Over 25% of all cases of STDs reported every year occur in teenagers. Sit on the edge of a chair, and place both feet flat on the floor. Relax your shoulders, and curve your arms over your head. 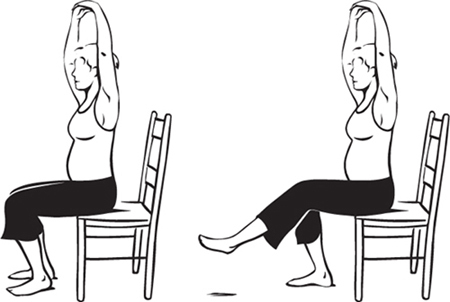 Keeping your back straight, hold in your tummy muscles while you extend one leg out in front. Using your thigh muscles only, lift your leg about 10 inches off the floor. Hold for a count of 5, then slowly lower your foot. Repeat 10 times with each leg. Tones thigh, hips and buttocks muscles.